On his way out the door, former Gov. Chris Christie signed off on legislation he once vetoed as unconstitutional, moving to unilaterally kill the bi-state Waterfront Commission of New York Harbor. The agency, created more than 60 years ago to battle the deep-rooted corruption by the mob on the docks of New York Harbor (later immortalized in the movie classic "On the Waterfront") wasted little time firing back. They went to federal court last week seeking an injunction against the state and its new chief executive, Gov. Phil Murphy. At issue is whether New Jersey can unilaterally walk away from an interstate compact that carries the force of federal law. "New Jersey cannot simply decide for itself that it no longer wants to honor its obligations under a bilateral compact ratified by Congress," said lawyers for the commission in court filings. "Congress and the legislatures of New York and New Jersey established the commission to eliminate corruption and racketeering at the Port of New York and New Jersey. The threat of corruption persists." The bill signed last week directs the governor, on behalf of New Jersey, to notify the Congress and the governor of New York of New Jersey's intention to withdraw from the compact creating the Waterfront Commission. It would turn over responsibilities for policing the port in New Jersey to the State Police. A spokesman for Murphy did not respond to a request for comment. The Waterfront Commission, which has its own police force to conduct investigations, has jurisdiction over all the region's piers and terminals--including the ports in Newark and Elizabeth. The political and legal fight over the future of the agency has been ongoing for years. Nearly a decade ago, the New York Inspector General issued a scathing report that found the commission to be riddled with internal fraud and abuse-- from the hiring of unqualified cops with inside connections, to the turning of a blind eye to businesses with criminal ties, to the deployment of cops who sat in their cars to save parking spots for commissioners. It called the commission a "sanctuary of political favoritism, corruption and abuse." The findings led to a major housecleaning at the commission. Still, there has been ongoing political pressure in New Jersey to do away with the agency. Some elected officials say the commission is living in the glory of its past, and that time has moved on from the days when organized crime was deeply entrenched in a shipping industry. "It has become a typical governmental bureaucracy that overstayed its reason for existence," said former state Sen. Raymond Lesniak, the architect of the bill that was signed last week. Cargo ships are loaded and unloaded at the Port Newark Container Terminal. The unions that represent the longshoremen have long chafed under the commission's tough licensing regulations and mandatory background checks that can mean the difference between working or being banned from the port. The shipping industry has had its own fights with the agency to end its control of hiring. The New York Shipping Association went to court, accusing the Waterfront Commission of creating a labor shortage at the port by holdng up hiring. They ultimately lost. But others suggest that while modern containerization and automated cranes have forever changed the nature of the work of loading and unloading ships, corruption and organized crime remains rife on the docks. "They say the commission has outlived its usefulness. It's no longer the 1950's," remarked Barry Evenchick, a lawyer who served as the state's commissioner in the wake of the reforms that followed the New York Inspector General's report. "I am not aware anything has changed. To say it's not needed anymore is to ignore the facts." 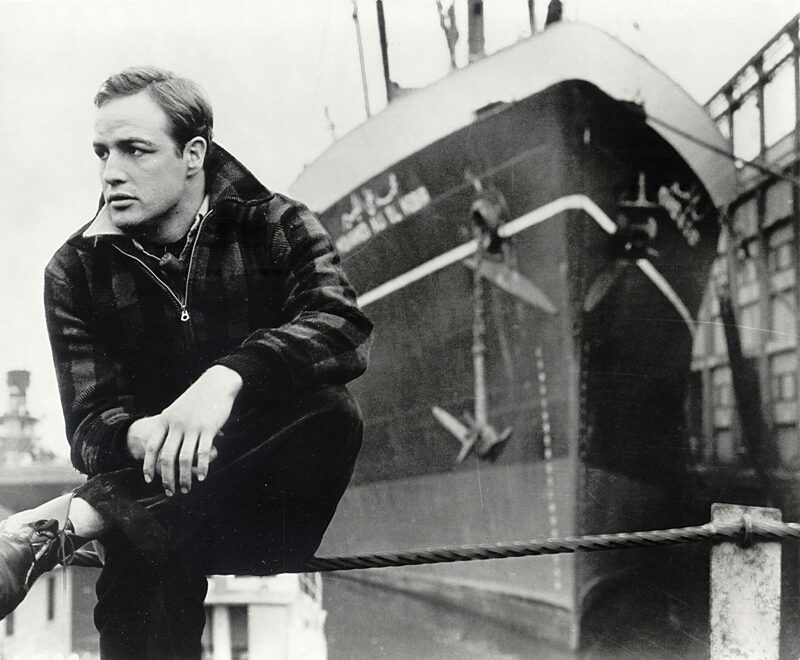 Marlon Brando in Elia Kazan's "On the Waterfront," the 1954 film that portrayed the rampant corruption on the piers that led to the creation of the Waterfront Commission. At the same time, the legal underpinnings of the compact that established the commission would make it hard for New Jersey to pull up anchor. It is bound by the terms of the agreement, said Evenchick and other legal experts. 'When Congress authorizes states to enter into a cooperative agreement, the consent of Congress transforms the agreement into federal law. I don't think a state can withdraw unilaterally," Evenchick remarked, who said he was puzzled why Christie signed the bill. Bernard W. Bell, a constitutional law expert and professor at Rutgers Law School noted that an interstate compact takes precedence over state law. "One state cannot change the terms of a compact unless the provisions of the compact provides for it," he said. New York officials have made no move to similarly withdraw from the compact. In its court filings, the Waterfront Commission said Christie's signing on his last full day in office of a law to withdraw New Jersey from the compact and dissolve commission was "a blatant breach of federal law because the compact does not permit New Jersey to unilaterally withdraw and repudiate its obligations." Attorneys for the commission noted that Christie himself in the past had admitted that it would be "illegal for New Jersey to withdraw from the compact," when he vetoed a bill nearly identical to the one he signed last week. "The compact is supreme to New Jersey law, and by its terms the compact does not permit New Jersey to withdraw unilaterally," they wrote in seeking a federal restraining order. At the same time, Walter Arsenault, the commission's executive director, said in court fillings that the industry continues to be plagued by organized crime and labor racketeering. Arsenault cited investigations in 2015 that led to the conviction of union officials, shop stewards, and foremen charged in the shakedown of their own union members on behalf of the Genovese crime family, and an investigation that led to the prosecution of ten others who took in millions of dollars from loansharking, unlicensed check cashing, gambling, and money laundering. A spokesman for the International Longshoreman's Association, which expressed gratitude in a statement last week to Christie for "supporting working men and women in New Jersey as well as the shipping community" in signing the bill to withdraw from the interstate compact, had no comment on the litigation. Lesniak, who has pushed the legislation for the past eight years, said the Waterfront Commission has cast itself as a bulwark against the mob, but accused it of "strong arm tactics" that sought to extend its jurisdiction to warehouses well beyond the port. He added that the compact that created the commission had always been intended to be temporary. "They point to busts and arrests, but it's no different from any other industry in New Jersey," he said.